Masks Vol. 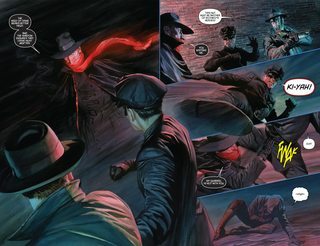 1 (TPB) (2013) : Before Superheroes, there were Masks! The Shadow. 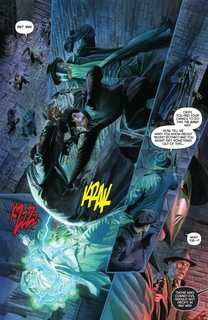 The Green Hornet and Kato. The Spider. In 1938, these masked vigilantes operated outside the law, working independently to strike fear into the hearts of evildoers. But when the corrupt politicians of the Justice Party transform New York into a fascist state run by mobsters, when an oppressive regime grants jack-booted stormtroopers free rein to imprison, extort, and execute the innocent, when the law itself becomes unjust – justice must be served by outlaws! 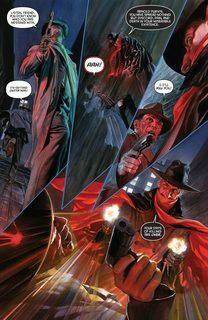 Outnumbered and outgunned, the legendary vigilantes emerge from the shadows to fight, joined by Zorro, the Green Lama, Miss Fury, Black Terror, and the Black Bat! Nine renowned pulp heroes, brought together for the first time in an epic conflict of Law vs. Justice!